We have started our weekly German class with Monika again. We have been learning a song about baking a cake called Backe, Backe Kuchen. You can find this song on YouTube if you type in the title. We have been acting out the song with Monika. We decided it was time we made a real cake – so this week we made Chocolate Cakes. We had four keen cooks to help. 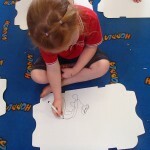 Today we put on some Spanish inspired music for the children to draw to after lunch. The piece of music was about 10 minutes long. 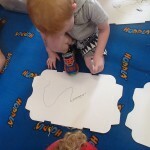 We will revisit this activity each week and add to our doodlings. 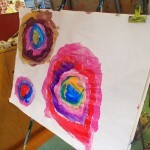 Teaching children to layer their art work is an important lesson. Today we just used black. 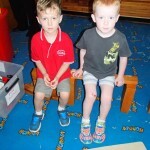 We might give the children the option of a different colour next week. 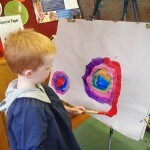 Look at Jasper’s Kandinsky inspired painting today! 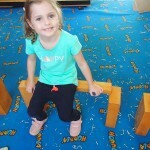 It has been super hot these last few weeks and the children have loved playing with water. We have filled up spray bottles with water and had some ‘water fights’ We have learned to respect when people ask us not to spray them in the face. 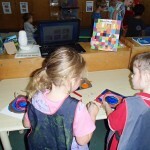 We have been painting with buckets and water. One day the spray bottles were filled with food dye and water. 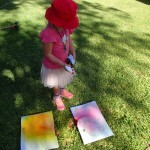 We sprayed on watercolour paper and the effects were beautiful. 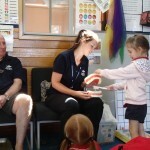 Once again our Pre School has had an annual visit from the Royal Flying Doctors – Dentist people. This is a service delivered free to isolated rural communities. We had a talk about how to care for our teeth and were given toothbrushes. Families were invited to take their children to the Dental Van for free check ups and dental work. Thank you Stephie and Gary for participating in this program and volunteering your time. 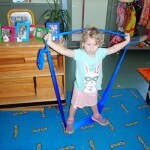 We have been using Strechy Bands this week to calm and stretch our bodies. 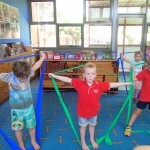 In doing so we have been developing our gross motor skills and exploring ways our bodies can make shapes with the bands. 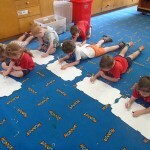 We can make a square, triangle and house shape. 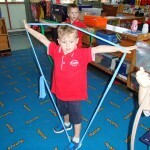 We can even turn a triangle upside down and make a rectangle if we really stretch. One of the goals of the pre school teachers in the cluster for 2016 is to use the work of famous artists to inspire our planning for children’s learning in this area. Our teaching to thie children will involve teacher modelling, teacher participating and exploring a variety of artist quality materials. 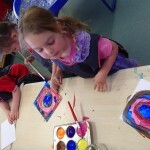 At Manangatang we have started with Kandinsky’s Circles. 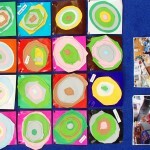 We have used acrylic paint on cartridge paper and cut out circles to create patterns. 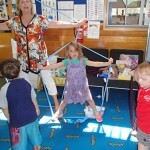 Collectively, the children’ and teacher’s attempts made an amazing disply. 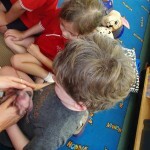 As teacher’s we were excited when Aidan grabbed Mum by the hand to show her what we had done. 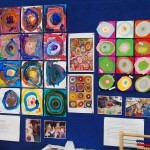 Hopefully the amazing displays will lead to a life long love of doing and appreciating art for these four year olds. Tao and his Mum are great at rescuing animals. The latest is a joey. He came to Pre School for a visit on his way to the vets. 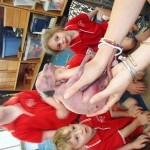 We will follow this up by learning the correct names for other ‘baby’ animals during the term. This story teaches us that we need to treat others like we want to be treated ourselves. 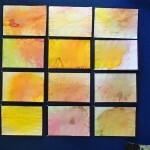 We have also made a lovely group drawing of cats with blcakliners and watercolours. 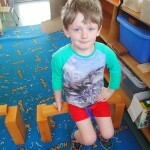 The children said, “Lets make some seats to sit on while we listen to the story.” They were wobbly old seats!